Rarely in Kirkland does the temperature get above 90º, but later this week it's going to top 100º. You're probably thinking "So what?" Well, probably 99.9% of my fellow Kirklanders don't have A/C in their homes, surprisingly most of my neighbors do, but I don't. It was 84º in my house when I went to bed last night. That's hot, isn't it? Anyway, I met a real nice guy from Dallas at the Tobacco Patch on Friday night, he was in town for a few days on business. I talked to him for a while and he offered me a Epernay cigar from his travel humidor. "Epernay? Hmmm, never heard of it." He told me they were good cigars, plus you know me, I'd never turn down a freebie. I thought that was pretty nice of the guy. Since I was already smoking a Romeo y Julieta Reserva Real, I put this in my pocket for another night. BTW, the RJ Reserva was excellent! This one was one of the larger ring sizes, so it easily lasted an hour. Mild to medium taste and smooth as silk. Very nice indeed. After dinner and dessert we moved out to the upstairs deck for cigars, which of course my good friend brought along as well. He gave me an Avo 80th Anniversary Limited Edition Belicoso. I'm not entirely sure if I've ever smoked an Avo before, but boy I sure liked this one - just a perfect cigar to top off an outstanding dinner. Kind of strange, but earlier when we were eating dinner outside on the lower deck, it started to rain, not real heavy, but enough to say "WTF?" It had been so nice all day long too. Anyway, the rain passed and the stars were out again, we kicked back, sipped on some rum and enjoyed. Sunday afternoon it was HOT outside, so my lovely wife and I decided to walked down to the waterfront and sit in the sun and kick our feet in the lake. We were going to go over to the marina, but it was kind of busy, so we walked down to what I call "Jake's Beach". It's the first Park south of the marina, nice big dock and some cement stairs that lead down into the water. My dog was such a chicken, he'd never jump off this dock. In fact, I use to take him to the end of the dock and jump in the water just to see if he would follow me into the lake. Heck no! He'd run all the way back to the shoreline and swim out to me. Crazy dog. 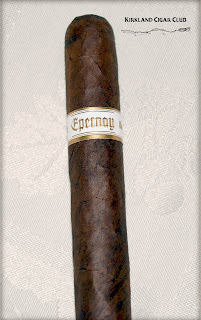 Anyway, getting back to cigars, I brought along with me the cigar that my Texas friend gave me on Friday night: Epernay Illusione. Slightly dark wrapper, but not black, packed a little tight, but not too firm to be concerned about. I lit it up as I sat on the dock. First thoughts - Hey, this is pretty good! I'm surprised that I've never heard of this brand before, but then again, there are so many brands out there that it's almost impossible to know them all, kind of like beer. I sat back in the hot sun and puffed away. What a nice smoke! Probably a medium cigar with a consistent taste from start to finish. Great draw too - billows of smoke, just the way I like it. Anyone see that Tango event over in the gazebo at the marina on Sunday? That was pretty neat! Gorgeous weekend in Kirkland! Perfect weather for being outdoors and soaking up the sun. Temp was probably in the mid 80's with a nice breeze out of the north. I think we're getting our payback now for all the crappy weather days we had this past winter. Heck, just a few months ago there was snow on the ground! Couple of events downtown - Kirkland Uncorked Festival(wine) and the Kirkland Classic Car show. I didn't have time to see the car show on Sunday, but I did wander down to the marina on Friday and Saturday and listened to some music, ate a little food and of course smoked a couple of cigars. Friday night I walked over to the Tobacco Patch with my lovely wife, stopped and got a mocha at Starbucks first - got to have something sweet to drink. I brought along with me the last of my Perdomos; Perdomo Reserve 10th Anniversary Champagne. I'm not going to go into great detail here, but one complaint about this cigar is the label - it's WAY too big. It takes up the whole bottom third of the cigar. Yes, it's a pretty label, but jeez, why so big? So the cigar itself was good, not superb, but good enough to keep me happy. Maybe a tad on the strong side towards the end, but a little sip of mocha usually smoothed everything over. With all the different blends of Perdomo cigars on the market, this isn't one of my favorites, so I doubt I'll buy these again. Anyway, Saturday rolls along, we do our normal stuff, plus we went down to the wine festival and ran into some friends - always run into people we know downtown. Saturday night we buzz back down to the Patch for a quick cigar. It's a little cooler tonight since the northerly breeze has picked up a bit - Mama is cold, so I doubt we'll stay too long. I didn't bring any cigars with me, so I went into the store to grab something that I hadn't tried before, or at least not recently. I picked out a Por Larrañaga. Wasn't all that expensive, big ring size and I think it had a Connecticut wrapper. This was a pretty fat cigar, so I gave it a punch instead of a straight cut. I lite it up and smoke it for a bit. "Hmmm? This has kind of a tough draw?" So I give it a straight cut to see if it improves any. Maybe a little, but I still had to work it to get any substantial amount of smoke out. What made matters worse is the wrapper started to peel off. YIKES! And it was coming off in a way where I couldn't hold it together with my fingers. WTF? So on to Sunday night - we went over to our friend's house for dinner. Another beautiful evening. These guys have a really nice place with a fantastic view of the lake, mountains and the Seattle skyline. Started out with appetizers and drinks, then a spectacular dinner and wine, and finally dessert. I was soooooo stuffed, but it was absolutely delicious. Anyway, to top off the evening my friend showed me his humidors - he has two. These aren't the little humidors like I have, these are actually pieces of furniture, the type of humidor that holds hundreds and hundreds of cigars. WOW! He told me to take anything I like. I'm not used to seeing that many cigars in one place - jeez, kind of makes you dizzy. Anyway, I see the jewel sitting on top - Montecristo No.2 Torpedo (Cuban). Oh man, you have got to be kidding me? So I grab my trophy and headed out to the deck. My friend brings out a bottle of Remy V.S.O.P. Cognac and a couple glasses. We lite up our cigars, sip our cognac and relax to the terrific lake and mountain views. The sun had gone down not too long ago, so there was that beautiful red glow above the Olympic Mountains. But anyway, what an evening! Plus, when we were out on the deck we watched the ISS (International Space Station) fly across the skyline. Now how cool is that! We finished our cigars and stepped inside for a late night coffee. This was probably one of the most enjoyable evenings I've had in ages, really a great time. Unfortunately I didn't get to bed until about 12:30AM. Oh no, again! Another great cigar weekend! It started on Thursday night with a La Gloria Cubana cigar. I’ve never tried one of these before, I’ve seen them many times and been tempted to buy them, but I never thought they’d be any good. Well, this cigar turned out to be an excellent smoke, really surprised me! I’m not going to rate this as one of my favorites, but for the money it was well worth it. 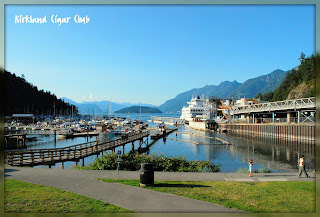 Friday we drove up to Horseshoe Bay in West Vancouver, BC, (Canada). We had a wedding to go to on Saturday afternoon. Interesting fact - I was born in Seattle and I’m a true Seattleite, but there is one city that is prettier than Seattle on a clear blue sky day: Vancouver, British Columbia. I kid you not. If you’ve been in BC before, you know what I’m talking about. Saturday was the wedding and afterwards we drove back to Kirkland, so we didn’t get home until late Saturday night. Yes, no cigar on Saturday. Sunday night we had friends over for dinner. I cooked up a little something and my better half made the dessert. I thought everything turned out quite good, except it was pouring down rain outside. I guess the grass and plants needed it. So this brings me to the cigar that I smoked last night: Perdomo 2, LE 2008. My fellow Aficionado had the Perdomo Patriarch Pyramid, both dark wrapper cigars. I brought out a bottle of Pyrat rum, Balvenie scotch and a bottle of Brazilian moonshine. We started with the sweet rum and lit our cigars. My LE was perfect in every way - burned right on the money, excellent draw, billows of smoke, smooth, not exceptionally strong, and a taste that would continue to surprise me the whole way. No complaints, of course I was feeling no pain with all the booze that I brought out. What a great evening though, didn’t get to bed until 12:30 AM, on a Sunday - Holy Cow, I had to get up at 7:00 AM. too! I was dragging all day, but it was well worth it. In fact, I think I might be doing it again next Sunday? Great weekend! I think this was the warmest 4th of July that I can remember. Temperature in the high 80’s, a little humid, not much of a breeze, but perfect nights for enjoying fine cigars. Friday night we had dinner at Trellis Restaurant, which is located in the Heathman Hotel in downtown Kirkland. Excellent restaurant, great food, nice wine list, outdoor seating - we ate outside since it was so beautiful out. After dinner we walked over to the Tobacco Patch, it’s only a couple blocks away. I wanted to try out the other Patagas cigar that I had left in my humidor. I was curious if this one would be as bad as the last one I smoked? We showed up at the Patch and greeted the gang, the usuals were there plus a few extras. I pulled out my Partagas cigar, guillotined the end and did my little flame routine. First few puffs weren’t too bad, but I also didn’t have a real good feeling about it. I smoked a bit more and said to myself “this isn’t looking good.” One thing I noticed about both Partagas cigars is that they’re packed too tight. Sometimes this works out OK, but overall I don’t like them packed this tight, just makes for a bad draw. Anyway, this cigar turned out to be almost as crappy as the last one I smoked. Luckily the conversation with my fellow Aficionados kept my mind off what I was smoking so I was able to almost finish it. Yeah, I’m not buying those again. Saturday, 4th of July, busy day, started off with our morning 4 mile walk. We were dog-sitting my neighbor’s dog, so we took her along with us. God it was HOT outside! Got back home and did the normal stuff around the house. We were going to a 4th of July party later and I needed to bring a salad, so I buzzed down to the supermarket and grabbed a few ingredients. This was going to be good! The party was out in Sammamish, a buddy of mine that I grew up with invites us every year. Lots of people, tons of food, loads of booze, what more could you ask for? The party was great and the salad that I brought was a hit as well, but of course I ate and drank too much. (ugh) We decided to leave around 9:30PM, it might be possible to make it back to Kirkland to watch the fireworks. Sure enough, we make it back home at 9:55PM, I grab a cigar and we walked downtown. I thought for sure that we might miss seeing the fireworks close up, but we lucked out and they didn’t start blasting them off until 10:10PM. It was a GREAT show! I’m so glad that we made it down there in time. After the fireworks we walked over to the Patch, it’s just around the corner from the Marina where the fireworks were. The place was packed. I brought along with me one of my most trusted cigars, those who follow this blog will already know which brand it was. Can you guess? Yep, Oliva. This was an Oliva Serie G Churchill. Without a doubt one of the finest cigars on the market. I LOVE these cigars! I’d smoke them all time, but I’m always looking for a cigar that measures up to it. Luckily I have found a few. Anyway, great evening, didn’t get to bed until 1:30 in the morning. So when I was at the cigar store today, the Perdomo rep just happened to be there with his goods on the table. I talked to him for a bit and noticed that he had a few varieties that I hadn’t seen before, so I bought 3 different ones and he gave me one for free. Tonight I’m going to smoke the Perdomo Grad Cru, Semilla Habano, crop of 2004. My daughter came over to the house a little later and brought me presents from Columbia, she just got back from vacation down there. She showed us photos from her trip and I opened the bottle of Aguardiente Antioqueño that she brought me. Hmmm, this isn’t bad. Licorice smell, but it doesn’t taste like licorice. Interesting. I like it. Anyway, I lit up my Perdomo cigar - the Maduro wrapper can be deceiving, I thought for sure this would be a little too strong, but it was smooth as silk for me, excellent draw and flavor up the ying-yang. I’d say it was a medium cigar +, not quite a full bodied, but probably the best Perdomo that I’ve smoked so far. The rep said that I’d enjoy this one and he wasn’t kidding. It’s a bit stronger than the Oliva Serie G, but not so much that you’d need to eat or drink something on the side. Truly a fabulous cigar and I highly recommend it. I love when I can end the weekend on a happy note. Cigar Night on a Thursday? My lovely wife and I took a long walk after dinner tonight and since it was still such a beautiful evening, we decided to have a drink and a cigar out on the upstairs deck. Neat-O! I usually don’t smoke cigars on a work night. I opened a 500 ml bottle (big bottle) of Bitburger beer and grab a Ramon Allones cigar out of the humidor. This was one of the cigars that came in a sampler cigar box that I bought at Costco. You know the sampler boxes that I’m talking about, they put a few premium cigars in it and then they stuff it full of duds just to keep the price reasonable. Well, most of these duds I’ve never smoked, so I thought now was a good time to experiment. First thoughts? Meh... This is indeed a dud. Little harsh, significant bite the entire time I smoked it. First couple of puffs were OK and the draw was great, but I didn’t like the taste and for sure I didn’t like the bite. Maybe it was too strong, but for me it was kind of a nasty cigar. I had to run back in the kitchen and grab something to eat just so I could struggle through this sucker. My wife didn’t much care for it either. The thing about cigars is that you’ll never know how they’ll taste unless you try them, and that’s what I like to do... Of course if your taste are like mine, you’ll want to just skip over this one.